The Upper East neighborhood is bordered on the north by Mission Creek and Las Encinas Road, proceeding across the old Mission bridge on Los Olivos Street through the Mission Park grounds to connect with Emerson Street, which borders Roosevelt Elementary School, and Prospect Avenue, abutting the Riviera, including Olive Avenue, Olive Street and Laguna on the east to Sola Street on the south and State Street on the west. It includes Alice Keck Park Memorial Garden and Alameda Park, which serve both the Upper East and downtown residential areas. Bungalow Haven has a separate Special Design District and, therefore, is not included in the Upper East. 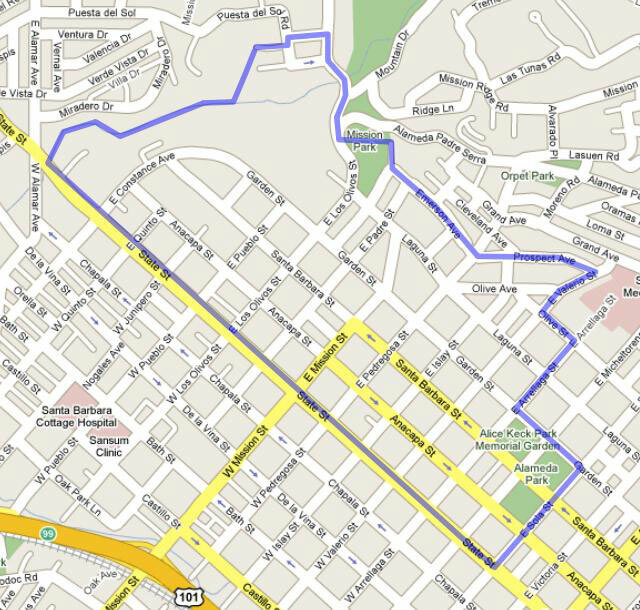 Significant portions of the Upper East neighborhood lie within the El Pueblo Viejo (EPV) Historical Landmark District. Alameda Park, properties fronting on Sola Street and on State Street north to Mission Street lie within Part I of the EPV. The Santa Barbara Mission, St. Anthony’s Seminary, St. Mary’s Retreat House, the Museum of Natural History, Mission Park and all properties that front on these sites lie within Part II of the EPV. In addition to the historical resources within these designated districts, many other properties within the Upper East have been designated by the City as Historical Landmarks or Structures of Merit. With the exception of the State Street frontage below Mission Street where motels and offices are found, the Upper East above Valerio Street is a district of large, prestigious homes, many of which are historically or architecturally significant. The Pearl Chase Society offers annual walking tours of historic homes and beautifully landscaped properties in the Upper East. Most structures are spacious single-family houses set back from the street on extensively landscaped large lots. Residents prize their hedges and walls that are designed to protect their homes’ privacy from disruptive traffic noise. Due to the age of estates in the Upper East, hedges that exceed zoning requirements may be legally-nonconforming. The Upper East supports efforts to retain existing landscaping while acknowledging the need to address public safety concerns of police and fire services on a case-by-case basis. The adherence to single-family zoning in this portion of the Upper East has provided protection for the considerable investments made by residents who wish to live in this attractive residential area. Since this is the only area of its type with advantages of a close-in location, the General Plan recommends that it be preserved with an overall density of three dwelling units to the acre. Along the southern border of the Upper East neighborhood below approximately Valerio Street, multifamily apartments and condominiums can be seen together with professional offices, churches, and schools. This type of development results from a mixture of commercial offices, medical offices, and multiple-family zones, and it reflects the General Plan, which calls for a density of twelve dwelling units to the acre. The major open space for the multi-family residential area in the southern portion of the Upper East is the three-block area containing Alice Keck Park Memorial Garden, Alameda Park, and Kid’s World. The interface between commercial/office and residential uses along State Street has the potential to create noise, on-street parking and traffic circulation problems. The height of commercial buildings could adversely affect views and privacy of adjacent residential areas. The gateway to the Upper East via Mission Street is constrained due to the lack of left turn lanes on Mission and State Street. A specific plan for the intersection of State and Mission streets holds the potential to resolve traffic circulation issues while providing services needed by the neighborhood, if neighborhood compatibility issues can be resolved. Residential and institutional uses coexist in the Upper East. The historic Old Mission and surrounding Mission Lands, including the architecturally significant St. Anthony’s Seminary tower and open space associated with the A.C. Postel Rose Garden and Santa Barbara Museum of Natural History are a few of the major City landmarks that draw tourists from all over the world. Presently an on-road trail exists on lower Mission Canyon Road, which requires crossing an old narrow bridge. An off-road pedestrian and bike trail through Mission Lands to the Natural History Museum is recommended. In addition to the Old Mission, the Upper East is home to a wide range of religious and educational institutions including: Santa Barbara Presbyterian Church, Church of Latter-Day Saints, Fielding Graduate Institute, Monastery of Poor Clare, Unity Church, St. Mary’s Retreat House, Unitarian Church, Church of Christ Scientist, Trinity Episcopal Church, and Our Lady of Sorrows. There are many group homes that provide care for the elderly, including Villa Rose on Los Olivos and Santa Barbara Streets. In addition, there are private, non-profit facilities for the education of children, including San Roque School, Notre Dame School, and weekday preschool care such as Starr King and facilities operated out of religious institutions. The Santa Barbara Museum of Art provides classes at their Ridley-Tree facility on Santa Barbara Street, across from the Alice Keck Park Memorial Garden. Many of these religious and educational institutions reside in historically or architecturally significant structures that, together with the activities that take place within these institutions, add significant cultural depth to the Upper East’s role within the community. St. Anthony’s Seminary and playing fields are used by the neighborhood as active open space (soccer games, summer camps, basketball, Frisbee, dog park, et cetera). Also, the site has St. Anthony’s Chapel which is a sought after acoustical concert venue. Attention should be given to future land use and transportation/circulation policies and strategies that will support continuation of these institutional uses such that they do not negatively effect the predominate residential uses in the Upper East. The core strength of the Upper East’ success is in maintaining a healthy balance that allows this mix of uses to coexist. The Upper East is conveniently located to downtown commercial and offices, allowing residents to walk, bike, or take public transit. Three major north-south traffic corridors exist through the Upper East as a consequence of the City’s downtown traffic grid circulation: Anacapa, Santa Barbara, and Garden Streets. Another major traffic corridor in the Upper East involves Mission Street from State Street east to Laguna Street, north to Los Olivos Street, and then into the complex series of intersections with Alameda Padre Serra, Mountain Drive and crossing Old Mission Bridge onto Mission Canyon Road. In addition to the traffic to and from the historic Mission area, this corridor carries significant volumes of traffic to and from Mission Canyon and the Riviera. The increasing volume of traffic on these corridors is a growing concern as is the increased speeding by many of the drivers. The complex of intersections involving Los Olivos Street, APS, Mountain Drive and the Old Mission Bridge crossing into Mission Canyon is a high priority for a special safety study for future improvements. Aside from the vehicle, bike and pedestrian safety issues that negatively affect mobility on a daily basis, serious consideration should be given to the life-safety issues that will exist in the event of an emergency evacuation of Mission Canyon residents who may be forced to vacate through this route. Such a study would need to respect the multitude of historic resources present in the vicinity and should look to identify improvements to provide safe pedestrian circulation between the many educational, park, recreational and institutional uses that lie on both sides of Mission Creek to serve residents as well as to encourage visitors to park and walk.